No matter when your business financial year begins and ends, December and January can be great months to reflect on the previous year, review results and help set the coming year’s objectives. What do we want to do better next year? Depending on the size and structure of your organisation, this can either be a solo project, or can be conducted as a workshop with other colleagues or stakeholders. 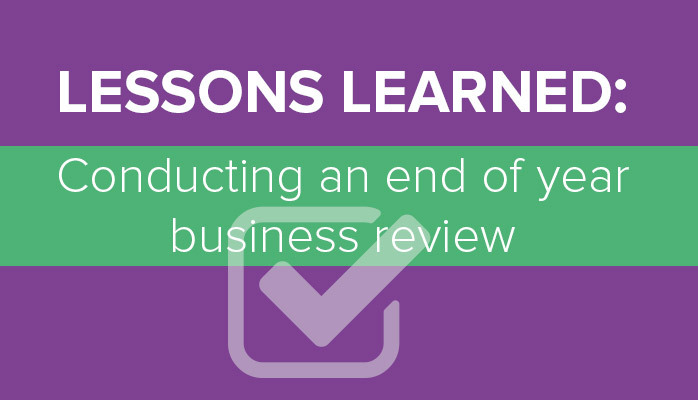 The process will be slightly different for any business, but I’m going to share some tips that I hope will help you successfully review the past year and prepare for the coming one. Don’t be too concerned about getting it perfect. It’s likely to need revising throughout the year. But it’s definitely better to have a journey plan than no road map at all! What did the business accomplish this year? Start with a simple list of all the things you can think of. There will probably be some metrics you can attach to this list – how many of something you made, how many clients you helped, how many boxes you shipped. Next, list what went well and what didn’t go so well. For each item on your list, make a note about what you can learn from to build success. It may help to break this down into categories, e.g. people, processes, technology, external relationships. Some items may be project-specific. Some may be much broader. The key thing is that these observations should yield valuable insights for next year. If you set some goals at the beginning of the year, this is a good opportunity to evaluate them. What did you do versus what you intended to do? There’s a danger here of getting bogged down in statistics and not making it beyond this point. Try to avoid information overload. Again, breaking this down into sections might help although hopefully you already previously identified the key performance measures. The following are examples to support a balanced score card. Take a bit of time to try and spot any particular strengths (are lots of new customers being generated from one particular sales channel?) and weaknesses (are you overspending in a particular area?). Taking some time to get back to basics can be quite enlightening. Remind yourself of what your business actually does. What makes it successful? What are your competitors up to? What is the industry up to? Could you improve what you’re doing? SWOT Analysis can be helpful. A new year is a good chance to make a list of ongoing tasks and assess whether you can you cut any out so you can better focus on next year’s goals. What should you keep doing? What should you start doing? Define your audience. It can help to be quite specific – give your core customer a name, a back story. Use this step to check your value proposition: what is it about your company or product that’s going to make it attractive to that customer? Does your current product or service satisfy their need or do you need to make any changes? As you build you plan for next year, stop and ask yourself at each step: will this help my customer? Now it’s time to shift your focus to the future. First, review (or create!) the overall vision (core purpose), mission (how you will pursue this vision) and values (how your company seeks to work) for your business. Getting these right can help make key decisions about your business. It also helps align everyone within the company which is vital for optimum performance. These should be realistic, but don’t need to be too detailed at this stage. Long term plans always change over time! Come up with a list of achievements for the business that you can turn into strategic business goals. 7. What does next year look like? Come up with a list of strategic priorities for the coming year. There should be no more than ten. Define some targets and measures for each of the priorities. Make sure you’re measuring the right things, things that actually count towards achieving the strategic objective, not just things that are easy to measure. Identifying the resource available and the people who are accountable is key. I can help you here with a simple and world class deployment matrix that delivers results. Will these projects and tasks help me reach my targets? Can I really do all this in one year? What do I need to make them happen (skills, assets, finances, facilities)? What obstacles am I likely to face and how can I overcome them? Finally, break this down into a plan for Q1. The deployment matrix is a compass and provides the direction needed to plan. Things will only get done with the support of others within the business. Communication is key. Not every team member needs to see all your thinking, but a few highlights from the past year and a positive plan for the year ahead should prove motivating. Going through this process should help give you a clear direction for the coming year. But you need to revisit it throughout the year to really get the most value. It may need revising from time to time. That’s OK. Just make sure you link any changes back to the overall strategic aims of the business to keep things moving in the right direction.